Earlier this summer, I was trying to think of some new ideas to build for the upcoming BrickFair. At the same time, I was watching the new series of Doctor Who and the two ideas came together. 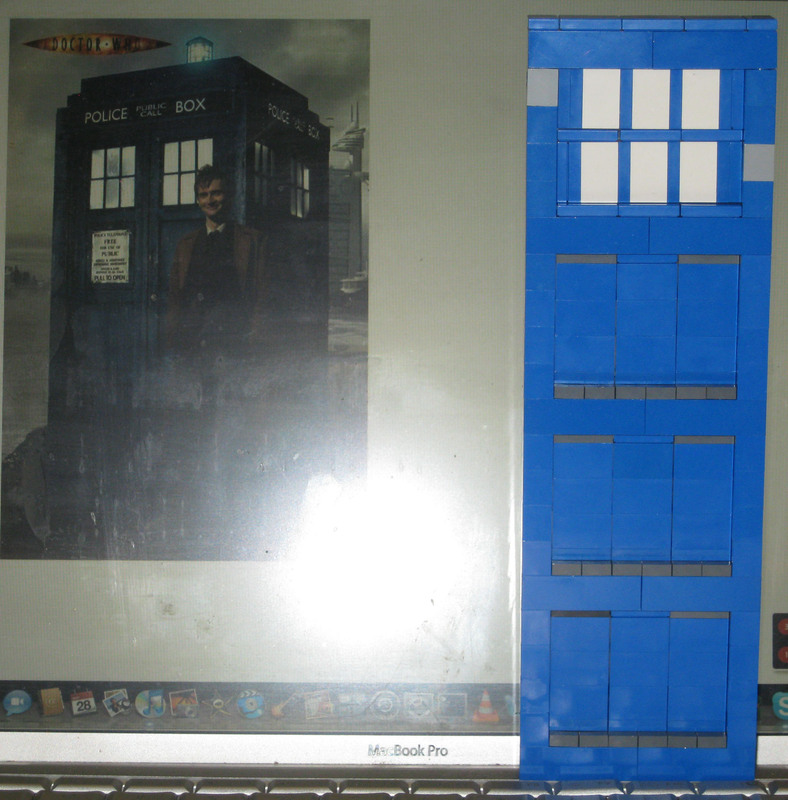 An amalgam of the Doctor’s time travel device and the Lego bricks with a technological twist was the goal. I based my design on the David Tennant Doctor and analyzed pictures of him with the TARDIS. After examining the pictures, the first step was to figure out a way to get the windows to look right. 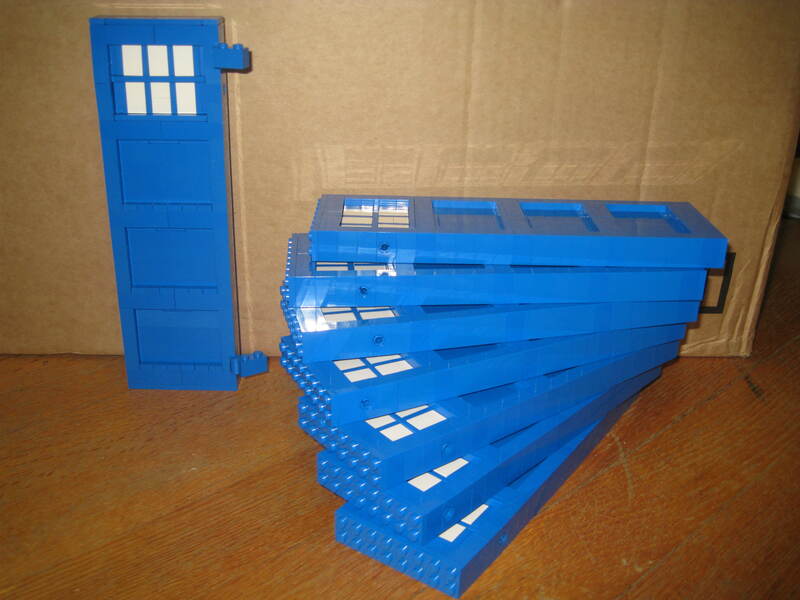 By laying out the white bricks with the studs on top wouldn’t allow the blue frame between the windows, so a different technique needed to be used. After talking to my friend Lee, I started working on a SNOT (Studs Not On Top) technique that would let me put the white bricks and blue plates sideways. After several tries, I found a technique that worked utilizing pins to hold the stacks in place, but then the lower blue sections needed to be repositioned to center them within the holes below the windows. I worked on a way to use jumper plates to center them in the holes in a satisfactory way. Once the panel was designed, eight of them were built in the proper blue color, unlike the prototype panel, and the framework was built to hold the panels in . This brought me to the phase where I wanted to add my usual technological flair. 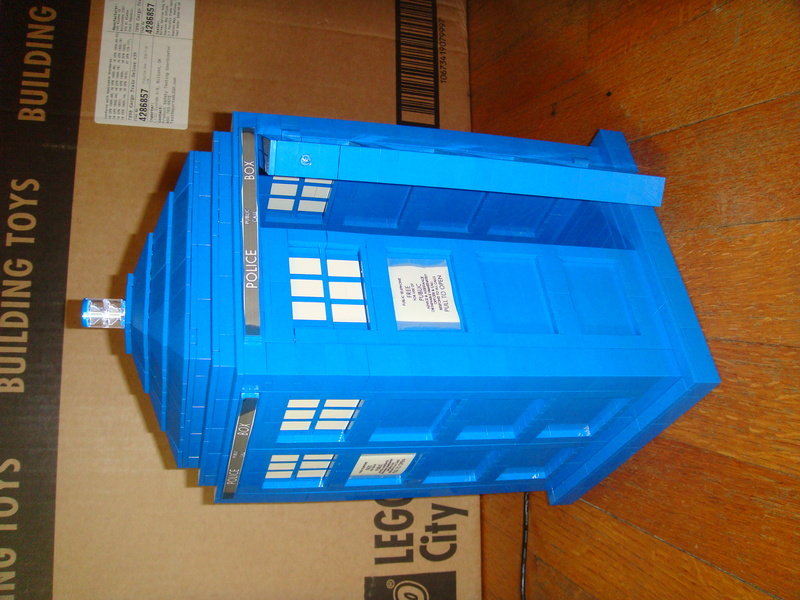 The three things I wanted to add to the TARDIS were flashing lights, a motor to open the door and a way to play the Doctor Who theme. The obvious solution to my concepts would be to use an Arduino Microcontroller to run everything. Since the LED lighting was the easiest of the three, it was quickly added and tested to fade the lights in and out like they do when the TARDIS travels through time. The original concept was to run a bright white LED to the top and orange lighting inside. Unfortunately, the orange lighting couldn’t be seen very well in a lit room, but the white light on top was much brighter and it was the more important of the lights to me anyway. I ordered and built a Wave Shield from Adafruit Industries to play the music. After hours of soldering and programming the Arduino, and spending several hours trying to work out an issue which turned out to be a problem with properly grounding the headphone jack, I was able to copy the Doctor Who theme from the David Tennant era in a wave format and play it with the hardware I had successfully prepared. I spent quite a few hours working with a stepper motor and motor drivers, but to no avail. I spent quite a few hours trying to get the motor to play nice with the wave shield, but the power requirements for the motor and the power used by the wave shield caused too many issues. As the deadline to finish the project loomed, a decision had to be made, and I felt the music was more important to the project than the motor, so it was removed. 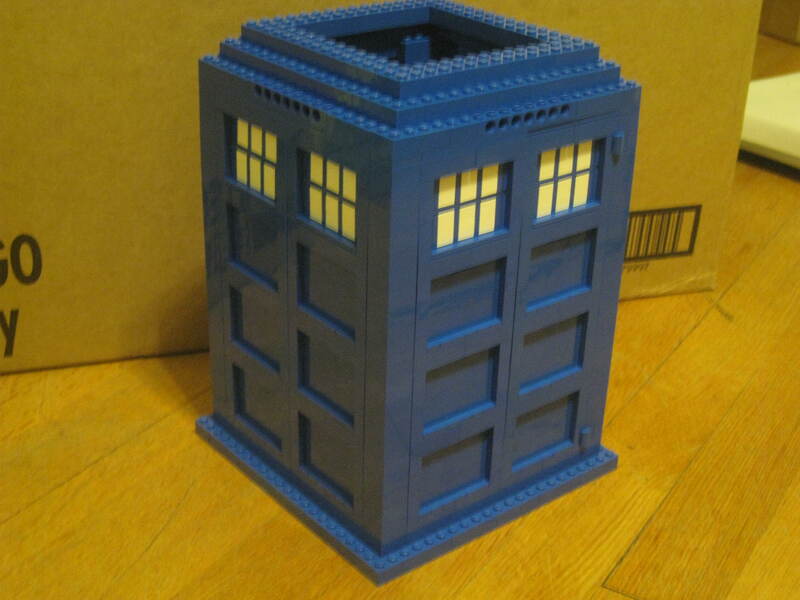 A lid was created to give the TARDIS a cookie jar aesthetic that would allow me easy access to the Arduino and to get better access to finish the inside of the TARDIS. 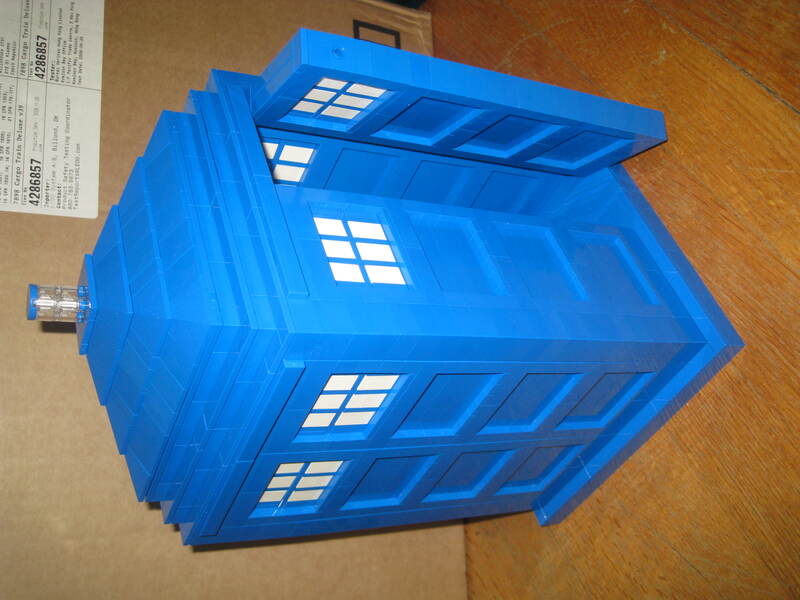 Once it was completed, all that was left was to add the stickers for the Police Box and placard to the sides and test it out. The TARDIS plays the Doctor Who theme and flares the light on top in and out then waits a few minutes before repeating the process again while plugged in. The TARDIS was a good experience in working with SNOT techniques for me and working with different power requirements for different hardware within the Arduino architecture. I am happy with the way it turned out and it was well received by those who saw it at BrickFair. If you’re interested in having anything built by me, please contact me via the link above or check out my Etsy store. Thanks. Arduino and LEGO Projects – My Book Is Finally Available!